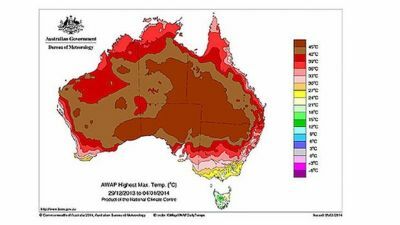 Australia experienced an extreme heatwave during January 2014. 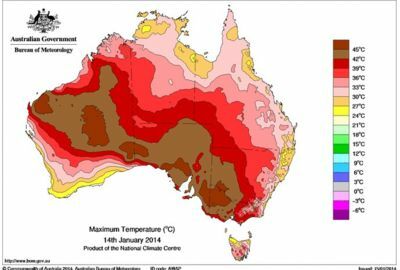 In early January, maximum temperatures in excess of 40C were experienced on successive days across Australia. Adelaide is predicted to be the hottest city in the world on Thursday 16 January 2014. Blistering heat formed over the Nullarbor at the end of December and continues over parts of inland Australia smashed temperature records and was a "highly significant" event according to the Bureau of Meteorology. In a special climate statement released on Monday 13 January 2014, the bureau said the latest heatwave, while less extensive and prolonged than the record-breaking hot spell to start 2013, was still a remarkable event. The report comes days after the bureau confirmed that 2013 was Australia’s hottest in more than a century of records, easily beating 2005. A major feature of the [latest] heatwave was the very large margin by which some records were broken, particularly in northern New South Wales," the bureau said. At Narrabri (NSW), 47.8 degrees observed on 3 January surpassed the previous record by 3.6 degrees, the largest such margin at any Australian location with 40 or more years of data. The heatwave began on December 27 in eastern Western Australia and spread slowly north and east, setting records at 34 sites where data has been collected for at least 40 years. Most of those sites were in Queensland and northern NSW. Parts of north-western Western Australia were hit by another bout of extreme heat with bureau charts indicating regions may reach 50 degrees on Thursday. In Queensland the statewide mean temperature on January 3 shattering the previous record by "an extraordinary 0.75 degrees", the bureau said. More than 10 per cent of Queensland and almost 15 per cent of NSW had their hottest day on record. Gunnedah Research (northern NSW) broke its previous temperature record by 2.8 degrees, the largest margin between the first and second-highest readings in any of the 112 primary locations used by the bureau. During the heatwave, Roma in southern Queensland broke its record high temperature on three separate days - December 29 and 30, and on January 3. Melbourne experienced 4 successive days of over 40C during mid January 2014, including 44C on Thursday 16 January 2014. Power outages were experienced during peak power usage periods during the extreme heat. Power generation was unable to keep up with demand during peak power usage periods and rolling brownouts (also known as "load shedding") were conducted by electricity utility companies. 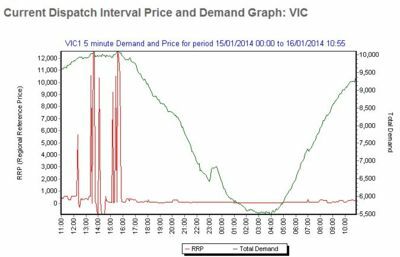 Power failures also resulted from problems on the Power Company networks, which are struggling to cope with demand from Victorians attempting to cool down. Up to 100,000 Victorian premises could be without power during the heatwave as demand cripples the state's electricity grid. Numerous power outages were also experienced due to faults. Citipower and Powercor reported 1766 outages across Victoria, including 225 in the Geelong area, 140 in Waubra, north-west of Ballarat, and 114 in St Albans. A bushfire in Perth burnt 46 homes and killed one person in Perth. Numerous bushfires were started in Victoria by extensive lightning storms during the heatwave. They were were controlled and put out by the Country Fire Authority. Soaring temperatures have forced nearly all matches at the Australian Open tennis tournament to be suspended after the tournament referee applied the extreme heat policy at Melbourne Park. Tournament referee Wayne McEwen deemed conditions unsafe for players with temperature of 43.3C on day four of the grand slam. 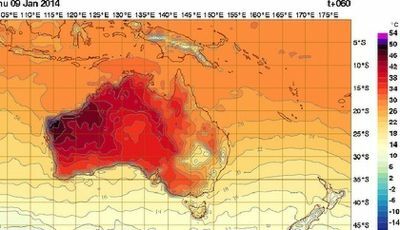 Professor Neville Nicholls, a leading climate researcher from Monash University, predicted that Victoria's mortality rate was likely to jump by at least 50 per cent as the mercury climbed above 40 degrees for three days running and was forecast to reach 44 degrees on Friday. Victorians were been warned to evacuate towns across the state as four out-of-control bushfires raged towards them. Emergency warnings have been issued for residents in the path of fires in the Grampians, west Gippsland, the Mallee and near the South Australian border. Industry sources stated that increasing the security of Victoria's electricity supply would depend on the amount people were prepared to pay for power, Australian Energy Market Operator spokesman Joe Adamo said electricity supply was ordered to meet weekly and daily forecasts of expected demand and this week had been tight in Victoria. Under such strong demand and extreme conditions, asset failure could occur and require load shedding - turning off power. However, an increase in capacity of solar power (domestic solar arrays and large scale solar) could provide increased capacity, especially on hot sunny days. The Australian government's 2013 State of Australian Cities report found people living in cities could be more susceptible to the effects of heatwaves. It said the heat island was "caused by the prevalence in cities of heat-absorbing materials, such as dark-coloured pavements and roofs, concrete, urban canyons trapping hot air, and a lack of shade and green space". A sustainable cities expert, Professor Steffen Lehmann from the University of South Australia, said cities trapped and stored heat "like a baking oven". "Cities don't cool down overnight any more because we have built our cities in a way that they are like a baking oven - they store and store and trap heat" he said. Of the nation's capitals, the report estimated that Melbourne had the highest annual average number of heat-related deaths, with about 200 a year. By comparison, the state's 2013 road toll was 242. The number of heat-related deaths in Melbourne is expected to more than double by 2030. During 2009's January heatwave, there were 374 more deaths statewide than would be expected for the week when comparing data over five years. The greatest number of deaths occurred in those aged 75 or older. On Friday 17 January 2014 68 fires were burning across Victoria, with firefighters battling dangerous winds and conditions that are the worst since Black Saturday. Arsonists have lit 12 of the fires. Fire Services Commissioner Craig Lapsley said the 21,000 hectare Grampians fire was so intense that it had “created its own weather”, triggering lightning and spot fires around Halls Gap. He said the Grampians fire could be seen from kilometres away and had "a 12-kilometre convection column... that is creating its own weather." A southerly change reduced temperatures by around 10C during the afternoon (5pm in Melbourne) but had the effect of fanning the bushfires in a different direction. More heatwave conditions and elevated fire risks were forecast for Victoria at the end of January and for early February, with temperatures in some towns in the state's north-west likely to exceed 40 degrees for at least six days in a row. Weak cool changes will spare Melbourne some of the worst of the extremes but the city can still expect 39 degrees on Tuesday. Another bout of heat returns on the weekend with 36 and 39 forecast for Saturday and Sunday, according to the Bureau of Meteorology. The temperature reached 42C in Melbourne on 28 January 2014 and several more bushfires started in north western Victoria. Public transport was again affected with speed restrictions imposed on trains when the temperature exceeded 38C. This is the first time Melbourne has ever had 5 days over 41°C in a calendar year. During climate change related heatwaves, turn off power to 10,000 Victorian homes and jeopardise their safety. remove or reduce the Mandatory Renewable Energy Target (MRET), not yet confirmed. ↑ Meltdown as heatwave cripples state's power supply, The Age, 16 January 2014. This page was last modified 23:05, 28 January 2014. This page has been accessed 178,114 times.